When thinking of problems that demand long-term solutions, nuclear waste management comes to mind rather quickly. With half-lives ranging from 30 to 24,000, or even 16 million years (Strontium-90, Plutonium-239, and Iodine-129 respectively), the radioactive elements in nuclear waste defy our typical operating time frames. 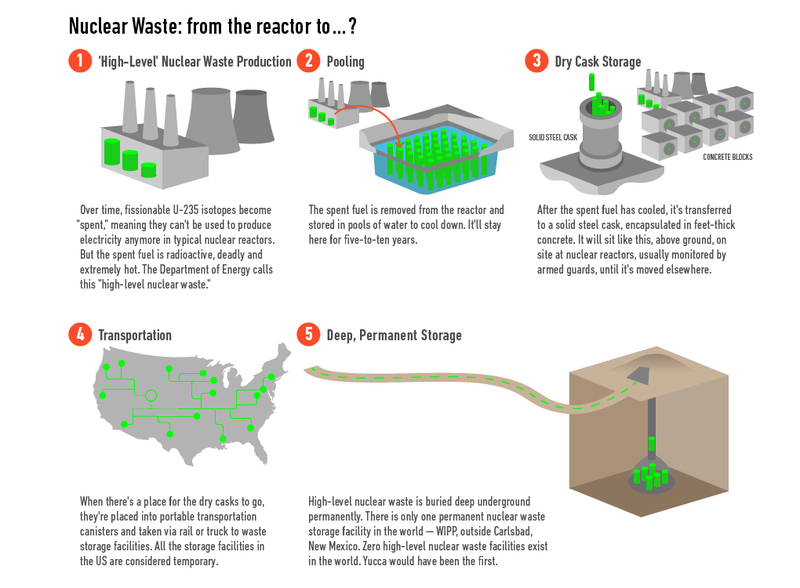 The question of how best to deal with that waste has been a matter of intense debate since the 01950s when the first electricity-generating nuclear reactors were built. Stroud chronicles how the storage solutions recommended by a 01957 NAS study went largely unheeded until the Three Mile Island meltdown twenty-two years later. The accident pushed the issue onto the public stage, setting in motion a process of political battling, scientific (and unscientific) study, and technological research that continues today. Though every presidential administration since Eisenhower’s has touted nuclear power as integral to energy policy (and decreased reliance on foreign oil), none has resolved the nuclear waste problem. The impasse has not only allowed tens of thousands of tons of radioactive waste to languish in blocks of concrete behind chain link fences near major cities. It has contributed to a declining nuclear industry, as California, Wisconsin, West Virginia, Oregon, and other states have imposed moratoriums against new power plants until a waste repository exists. Disasters at Fukushima, Chernobyl, and Three Mile Island have made it very difficult, expensive, and time-consuming to build a nuclear reactor because of insurance premiums and strict regulations, and the nuclear waste stalemate has added significantly to the difficulties and expenses. Only two new nuclear power plants have received licenses to operate in the last 30 years. With nuclear waste storage, time is always a factor. How long must a waste storage facility remain impenetrable to avoid harming humans well into the future? In the 1990s, the U.S. Environmental Protection Agency said 10,000 years. This decision was based in part on predicted frequencies of ice ages but it was essentially a guess. Later, that standard was increased to a million years by the U.S. Court of Appeals in part due to the long half lives of certain radioactive isotopes and in part due to a significantly less conservative guess. The increase in time from 10,000 years to 1 million years made the volcanic cones at Yucca look less stable and million-year-old salt deposits — like those found in New Mexico — more applicable to the nuclear waste problem. DOE hired anthropologists to study the history of language—both at Yucca and at the WIPP site in New Mexico—to conceive of a way to communicate far into the future that waste buried underground was not to be disturbed. But the Blue Ribbon Commission’s report earlier this year calls these abstract time periods a little impractical. “Many individuals have told [BRC] that it is unrealistic to have a very long (e.g., million-year) requirement,” it reads. “[BRC] agrees.